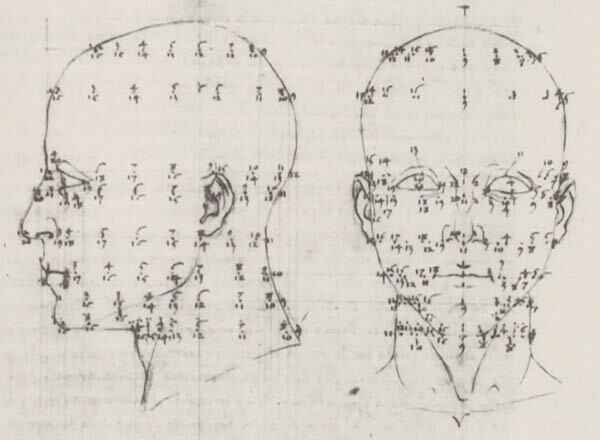 Mensurations of the human head, from the treatise dedicated to Guidobaldo da Montefeltro (ca 1482) by Piero della Francesca (1416-1492), De prospettiva pingendi, facsimile of the Parma, Biblioteca Palatina MS 1576. Source: Collection Centre Canadien d’Architecture/Canadian Centre for Architecture, Montreal. Reproduced from Piero della Francesca, De prospetiva pingendi, Documents of Art and Architectural History 2.1, by arrangement with Broude International Editions, Inc.